A weather-sealed lens shouldn’t let any dust, sand, moisture or other elements inside of it. But weather-sealed doesn’t make it sealed against insects, apparently. Roger and Aaron from Lensrentals recently had a Canon 70-200mm f/2.8L IS II lens dismantled to remove a dead fly from it. Now that’s what I call a bug fix! Other than removing the fly, Roger and Aaron tested the lens out to see how it affects the image. And surprisingly enough, a dead bug inside a 70-200mm lens doesn’t affect the image quality nearly as much as one would have thought. When the lens is stopped down to f/22, zoomed back to 70mm, and focused at minimum focusing distance, there’s a pretty sharp, black blob. Still, you can’t see the dust in the lens or the poor fly’s detached legs. Following the Murphy’s Law, the fly got stuck in the deepest groups, as far as possible from the front or the rear element. So, the guys had a hard time getting it out. It took two hours only to disassemble and reassemble the lens, with nearly two more hours of cleaning and lens adjustments. 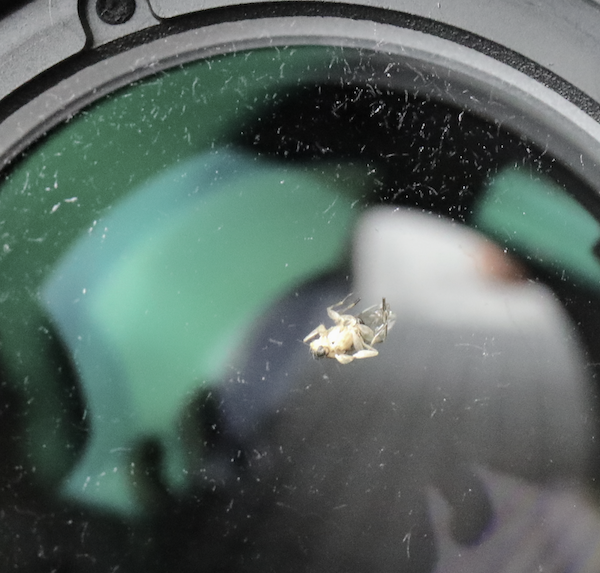 Of course, I have no idea how the heck a fly can get inside a weather-sealed lens or any lens for that matter. Roger believes that the fly they removed entered from the rear side of the lens, explaining his assumption. Roger believes that the fly got in at the maggot stage and hatched inside the lens, which was also my first thought. Anyway, it’s super-weird to find a fly inside of a lens, but it’s good to know that it doesn’t affect the image all that much. So the next time you notice some dust inside your lens and think that it will ruin your shots, just remember this. Make sure to read the full write-up and see more images of the disassembly on Lensrentals’ blog. Photo on the fly? Nope: fly on the photo.